As part of of our ongoing CSR initiatives, the team at BMIT ended the month of March with an activity for a good cause. 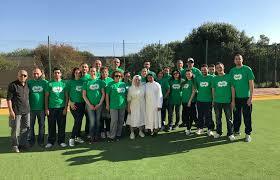 More than 25 of our staff members made their way to the St. Joseph Home for Children in Żabbar to help the Dominican Sisters with maintenance work around the home as well as installing new basketball hoops for the children. The BMIT team got their hands dirty and put their metalworking skills to the www as they installed a canopy, assembled new furniture as well as painted the washroom and other areas of the home.